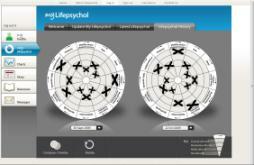 Lifepsychol is an easy-to-use, patient-driven system which is bringing meaning to quality of life. It enables people to define their own quality life issues and then records how their quality of life is changing whilst living with a long-term, chronic condition. As well as providing structure and focus for a consultation, completing a lifepsychol at regular intervals can help people with long-terms conditions and their health professionals monitor and manage any changes that may be impacting upon their quality of life. The selection of areas is based on research which highlighted particular issus that patients frequently wish to discuss when talking about how their illness interferes with their life. This research includes the Lifepsychol survey, details of which can be found by clicking on 'Lifepsychol Survey' above. Every completed Lifepsychol is stored for the patient to view and compare, enabling them to show any change that could be taking place in their life. 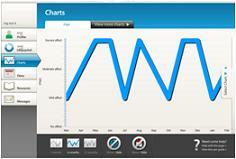 Once a patient has recorded at least two Lifepsychols, the system will provide detailed charts. The Lifepsychol system is the idea of Dr Neil Bindemann, who has worked in medical communications since 1993 and set up Innervate Ltd in 2001. Inspired by work with people suffering from Multiple Sclerosis, Neil recognised the need to provide a simple way for people living with any form of illness to visually express how their quality of their life is being affected, in order to encourage discussion on how best to support them. He believes that the ultimate aim in healthcare is to deliver a product or service that provides patients with best quality of life possible. Furthermore, by gaining a better understanding of what effects a person's quality of life and how it changes over time, it is his belief that this can help people to engage more effectively the healthcare service. With the input of various colleagues and patients, we have created a system that not only helps people give a detailed insight into changes in their quality of life, but it also links users to supporting information to help them with the various challenges they face whilst living with a long term or life-threatening condition. We believe that, at the very least, Lifepsychol helps and encourages people living with a life-threatening of long-term condition to discuss their quality of life issues with their health professional. After all, as one person who completed the Lifepsychol survey very poignantly remarked, "Don't ever make assumptions about what others may value in their quality of life - ask them!"